The 10th anniversary of Eden Festival was an absolute marvel. If you are looking for festival hilarity, great people, a stunningly beautiful winding weaving site and so much on the line up, with so many fantastic areas that you just cant fit it all in, then Eden festival is the place to go. This year Eden festival smashed the ball so far out the park, its probably still travelling through the sky, high on life, bouncing, bobbing and smiling all the way. Incapable of coming down. Just like the stupendous people who were still grinning from ear to ear and high fiving each other as they begrudgingly left site on Monday morning. From the moment you enter the site into the depths of the Raeburn Hills in Dumfries and Galloway you meet shiny happy people. 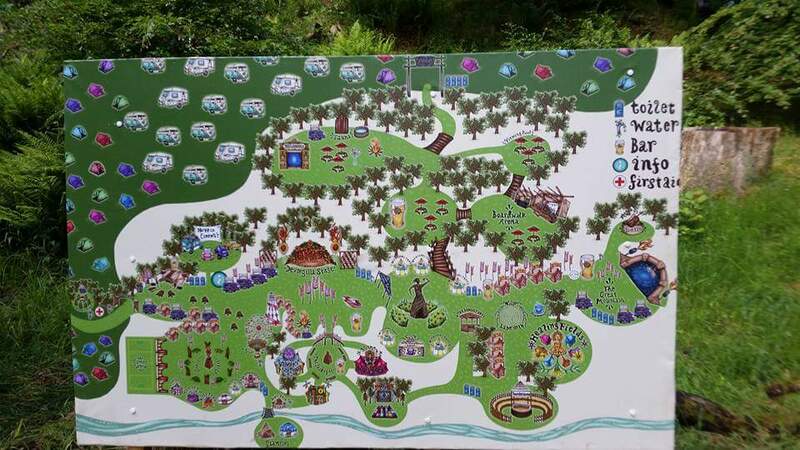 You are greeted by a well organised gorgeous site, decorated with giant flowers, impressive lazers, trippy paintings with a truly fabulous amount of effort put into each enticing area marked on the new site maps dotted about. Festival goers donned fantastic costumes, wore friendly smiles and the sound of genuine laughter and love was consitantly shared among each other as if reuniting with old friends. The sun was glorious all weekend with just a few short lived yet impressive torrential down pours. Nothing the site could not handle and it wasn’t long before the sun came out again, drying the ground in most places and tanning the skin of everyone within. You cant beat a stupendously sunny festival. Especially one with plenty of seating dotted around each area, plenty of covered corners and large tents to momentarily take shelter in while the showers drenched and the rainbows shimmied. Give it a few minutes and its glorious sunshine again, the fresh smell intoxicating and the flowers in the garden seeming to grow and gleam in their new shiney clean water streams. The site itself curves and swerves along the river side. The main thoroughfare a colourful and eclectic array of food from around the world and bright glittery things that anyone with a love of sequins and shiny could not possibly resist. And there is so much to do for all ages. the kids field is just full of hula hoops, juggling toys, yoga for children workshops and various activities including guddling around in the river with fish nets and paddling in rock pools. Even the adults were in the river most mornings, washing off the face paint from the night before and the dregs of a short nights sleep and a long night dancing on your feet. There is a buzz in the air and squeals of excitement all round as we drive past the edges of Eden’s campsite, on the way to the main entrance, seeing titillating glimpses of the festival in the distance, the fairground rides, the tents, the curve of the trees and the colourful campers, only adds to the thrill of arriving at the fantasy land that is Eden! I arrived on Thursday, with my friend who was running baby and children’s yoga workshops, and her baby to help get her set up. The others were due to arrive in dribs and drabs over the course of the next 24 hours. There was a backlog of traffic so it took us about 45 minutes to get off the main road onto the site, but this allowed for everything to be run safely, for amnesty bins to be filled and wristbands to be distributed. Things got a bit confused in regards to where we were camping, being directed to crew camping which was too far for us to carry our yoga mats, and relocating back to the main campsite raised some difficulties due to the one way system, but with the help of some friends, and the kindness of strangers we got there in the end. Setting two tents up in the heat of the afternoon sun was a challenge but made that first refreshing cider of the long weekend all the more rewarding. The stewards were pretty heavy when it came to checking wristbands and looking out for glass bottles or containers but it didn’t cause any disruption when it came to the flow of human traffic. Eden’s in its tenth year so things are run pretty smoothly and efficiently. 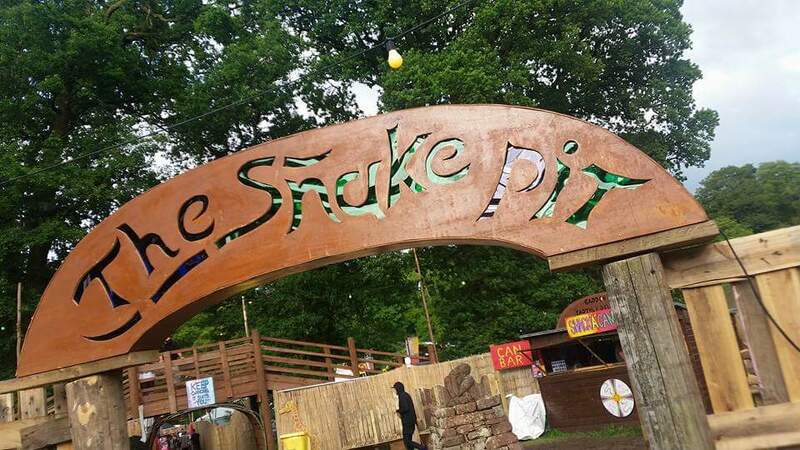 The terrain was pretty rocky and bumpy, it hasn’t quite recovered from last year’s festival which was a sloppy mudfest, non electrical wheelchair users may have to work hard to get around and there did seem to be a lack of disabled toilets. We spoke with a lady who uses two walking sticks and she said there was plenty of places to stop and rest along the way when needed, without having to wrestle her way in and out of tents or areas, and she would expect every festival site to come with its own difficulties so found the Eden site and arena to be perfectly manageable. Not long into the evening we found out that free body paint marbling was available to crew members courtesy of the lovely staff at Psychedelicdip.com so began the start of our festival fashion show, Eden tends to bring out the colourful and creative side of even the most modest dresser. Meanwhile the lovely sisters at Eco Enchanted offered biodegradable glittering for all, adding to the sparkle and glamour, while contributing to the environmentally friendly approach that Eden advocates. 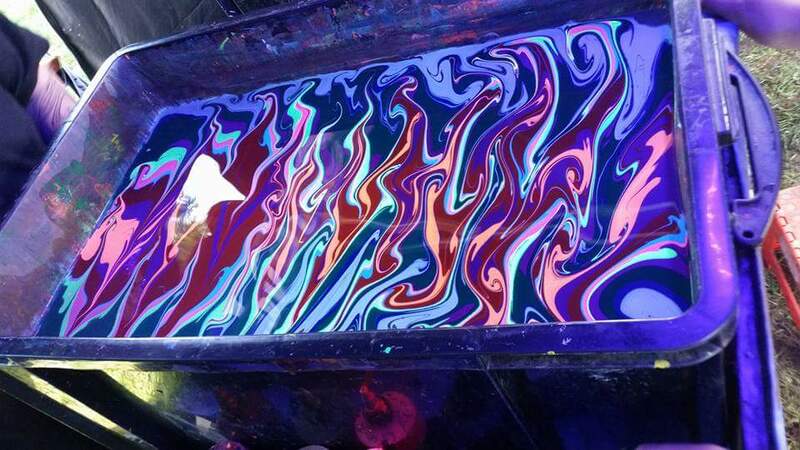 Eazel Weazel’s stall provided an opportunity to decorate your welly boots or paint a picture using stencils and spray paint. Easy Skankin’ Crew’s Thursday Takeover at Bob’s Back Passage kicked off a weekend of dancing and prancing, bringing together their unique sense of family and community, with a dub based set from dj duo Dabz, and a pure ska and two tone set from Miss Merkin, which had the whole tent jumping and skanking. Next for us was the festival’s original bar and stage Rabbie’s Tavern for The Mad Ferret Band, who brought their speed banjo playing skills to a medley of sea shanties, ceilidh and celtic songs, creating a good old fashioned knees up to revellers of all creeds, this is the beauty of a Thursday night start, where not every stage is open, it brings everyone together for that first big shindig of the weekend. After some time spent visiting friends campsites we headed back for a post midnight feast, it was £4.50 for a small cone of sweet potato fries, at one of the last two remaining food stalls, but boy were they worth it, by that time everyone had worked up an appetite, and were happily tucking into burgers at one stall, while there was a chip frenzy at the other. The day started with us revisiting the new venue on site, Bobs Back Passage. What a place! Great coffee, tasty cocktails and an amusing line up of singalong comedy rappers, funky DJs, Drag Queen Gay Bingo and a luscious lounging area both inside on the benches and outside in the booths. An awesome addition to the Eden extravaganza. Walking further around the site with many visits to the well stocked and well staffed bars, grabbing a drink en route from here to there with a large group of friends in tow was easy and fast, no excessive queues and most bars had free jugs of water available for you to help yourselves. Fantastic! The garden in the centre of Eden is a truly beautiful affair. The festival invites its customers to bring their own plants and add to the garden each year. As we languished in the burning sun in grass sunken loungers and on pretty wooden benches, we met people who had planted small trees and shrubberies in honour of the birth of their children or the loss of a loved one and had come back to see them and water them lovingly this year. A beautiful idea and one that moved many people, including ourselves. 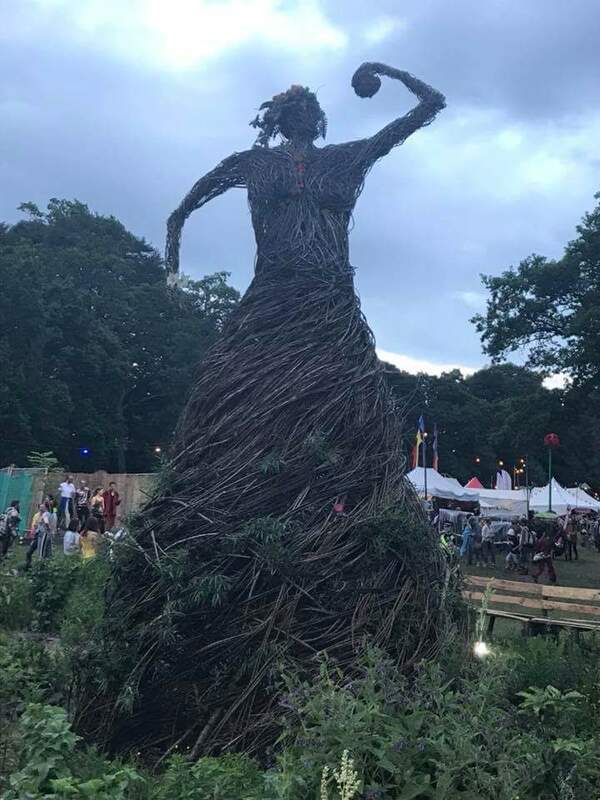 We jumped, jollied and jigged from artist to artist as we traversed the site, trying to help our first time Eden goers to navigate the organic and flowing site while enjoying all the sights and sounds it has to offer. No joking aside and not because the site is that humungous, but it can take up to two hours to cross the undulating and rolling, gets your neck twisting and eyes scrolling site. So much to grab your attention. We stumbled up the curvaceous hill paths upon the Melodrome and sat nearby in the viewing area while the sounds from the lyricists curled up towards us. We found what seemed to be the parking area for the mobile musicians tinkling and fiddling around the site before it got squidgy with rain. So many smells to be followed and located and the wares of which to be tasted. Then there are the masses of beautiful people who stop to say hello, admire each others costumes so much so that it makes getting anywhere quite slow. But thats what you want isn’t it? A bumbling pace, far away from the normality of the hum drum rat race. Our bodies set an enjoyable snaking pace, as we adventured all over the place. Not making a very good job of noting who was playing what and where but loving the sounds drifting through the air. We sat on classic motor cars at the drive in cinema shooting the breeze, talking cheese, our minds relaxing and the incessant heat demanding relaxing. Down the snake pit it all goes a bit mental. Four fabulous venues all branching off from a central seating area. All with different sounds for different moods. Sitting outside is just THE best people watching spot you can hope for. From the expulsion of sweaty over danced people from the trance selections in the Voltan Temple who exit one of the dark engulfing wooden tunnels with exhausted limbs and the need for assistance to the nearest sit down. From the still grooving and moving people emerging from the Ghilli Dhu dance emporium, to the laid back marshmellow meandering people who have chilled in the beautifully lavish Vishnu lounge. Where you can languish in bath tubs, swing in hammocks, snooze in a bed or just lay on couches and blankets instead. Its all about the chill factor in the Vishnu Lounge, which at some time in the early evening was where we were to be found. Then we were off to the Lost Disco, down wooden tunnel number four for a spectacular set by JFB leading into an incredible heavy and stupendous dance off with none other than world renowned STANTON WARRIOOOOOORSSS!!! 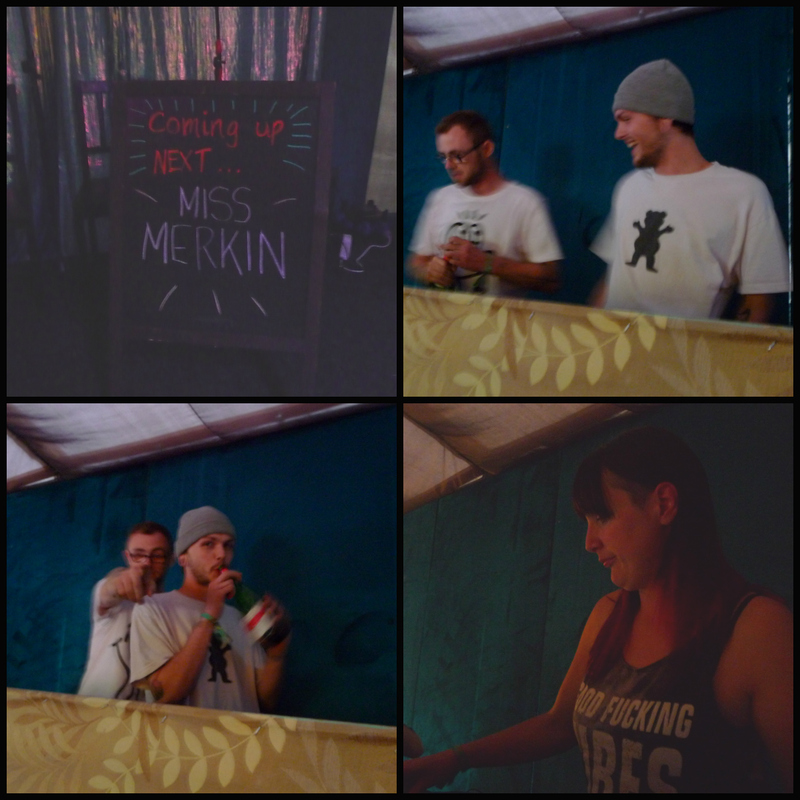 So impressive to see such an awesome DJ duo in the wooden hut of the flaming hot Lost Disco. They were stonking. The strobes and the giant disco ball, the flashing LED dance floor and the lazer show. Literally so much going on it felt like some kind of dance trance dream scene paradise. My feet hurt from the dancing, my face ached from the grinning and the moves spun out by the appreciative crowd are etched on my heart forever more. After that, all bets were off as to the timing of anything or where we went. All agreed it was most colourful, most friendly and we moved around so much not a midge from the occasional swarm could touch us. The morning was an unusually early rise to trek to the Devorgilla main stage for the Dumfries Community Choir. An absolute must see performance by this local troupe, if you want to hear beautiful renditions of many known favourites. A wonderful innovative set and of course, the finale of their festival favourite Stone Roses, I am the resurrection. The crowd were ecstatic as usual. Topped off by an emotional dedication by the choirs front man to his beloved oversized caterpillar boyfriend in the crowd. Due to be married in three weeks. Such a sweet adorable moment. Then it was time to really work the already aching muscles and build up quite an entire body sweat fest, as the field filled fit to rammed for the energetic magic of Mr Motivator. The crowd eagerly followed his work out instructions, marching from side to side while pumping arms in thei air and shouting all sort sof Huh! Yeehah! Old and young, exhausted and sprung, every sort of body was there doing their best to keep up with Mr Motivators never ending energy. There was nothing but joy and determination in the field. and once it was all over a big pile of collapsed exhausted people everywhere. So off to the river for a well deserved dip in its cool refreshing waters! Next stop back to camp for doning the festival attire. Biodegradable glitter at the ready and Legendary Realness coming to Eden by Maddjakallss Productions. Talisk’s hypnotic tribal Saturday night set on the now iconic Mountain Stage showed not only why this festival is beginning to ooze with curatorial confidence, but that it is prepared to programme up and coming folk at headline moments which the audience lapped up in abundance. The lighting design was only slightly overshadowed by the BBC Folk Award winners, led by the infectious concertina playing Mohsen Amini, the ferocious fiddling of Keenan and the jaw dropping rhythm of Armstrong’s guitar. As we found ourselves wandering back through the festival enticed by the thumping yet wobbly bass of the legendary Zion train, we stopped along the way to enjoy the fireworks which were coming from an undisclosed location. All eyes glued on the crackling and sparkling display, we could not help our feet from tapping out shapes to the hypnotic basslines still pulsating from the Devorgilla stages soundsystem. It was decided unainamously that we should follow our feet to the dancefloor and stomp one out for the mighty dub giants Zion Train. Stopping for a short break inbetween to refresh and reflect we swung into the snake pit nestling ourselves comfortably in amongst a group of the most beautiful festival weirdos (us included) and proceeded to talk codswallop for an unknown ammount of time before the addictively funky grooves of shakti mama disco summoned us yet again to our feet and into the lost disco. Lost in the disco we were indeed, as we found ourselves emerging from the snake pit to a dawn chorus as the sun started to rise. Tired yet full to the brim with sparkle and shine we trundled back to camp to the beats of a trance inducing drum circle that was forming around the communal campfire. happy with our lot for the night we all drifted into a blissful sleep back at base camp. Sunday was all about The Colonel Mustard and The Dijon 5 setting everyone on fire and keeping the energy high and live. Stealing the show with a crowd pleasing set that brought this diverse audience together through their highly interactive, yet politically driven song book of complete and utter nonsense, sprinkled with Glaswegian verve and humour on a soundtrack of camp and unpretentious synthesized reggae-come-stereo-pop. The Mustard lives up to its Umami reputation by leaving a taste in your mouth that lingers beyond consumption like that of Wasabi. In Rabbie’s Tavern we stumbled across a bluegrass five piece, The Daddy Naggins from Glasgow. They tinkered their way through an eclectic mix of well-known ballads and pop tunes, as well as an unforgettable climax of hip-hop blue grass. 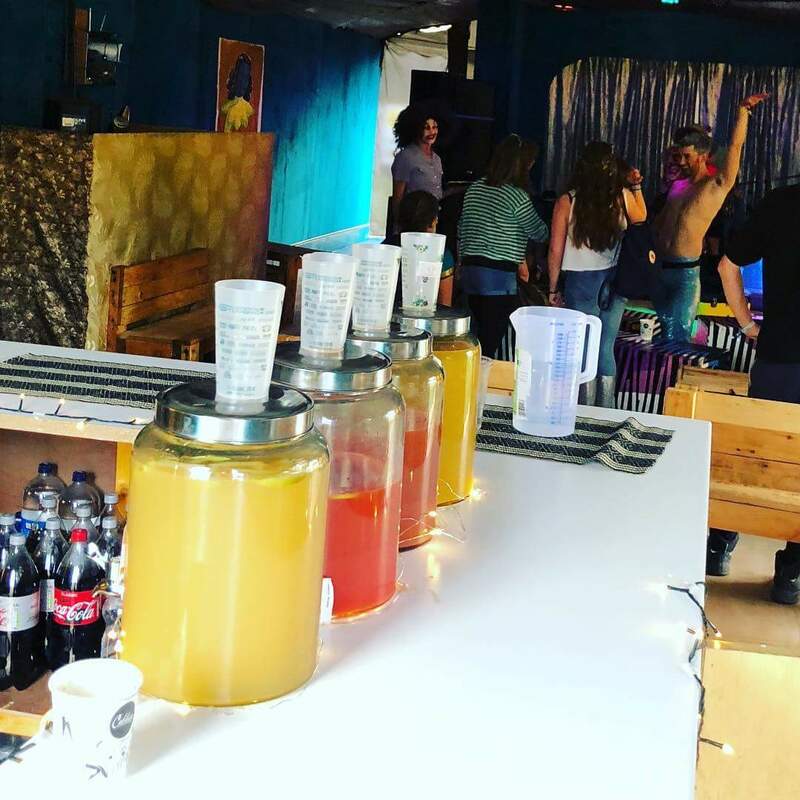 The booze soaked crowd entered bleary eyed with last night’s hangover cocktail which was defiantly stamped out by the foot tapping yee haw! So much folk dancing the ho-down that the swinging around made our arms sore! On the melodrome stage we were lucky enough to catch two glasgow based bands , The Twistettes and also The Girobabies, who each played out a tremendous set of their unique stylings. Sibling duo, The Twistettes with their glaswegian-punk-blues-grrrrrrrl-riot offerings got the party well underway with the crowd lapping up the simplicity of this grizzly sounding duos gorgeous sounds. Their set spanned all of their albums their debut jilt the jive taking centre stage. Shortly following the duo were the fantastic Girobabies a glaswegian rap-soul-punk-funk-grungesque ensemble who blew the crowd right out of the water with their unashamed melting pot of genres and influences. Lead man Mark Mcghees banter laden and rhythmical lyrics capturing every ounce of the crowds attention as he furiously wrapped his words around the impeccable rhythm section, crunchy and unexpected guitar riffs and grungey bass that define this bands sound. Submotion Orchestra deserve a special mention for a glimpse into their well-heeled and crafted mix of sonic future sound blended with their blend of jazz infused dub-step which has made them favourites on the festival circuit. 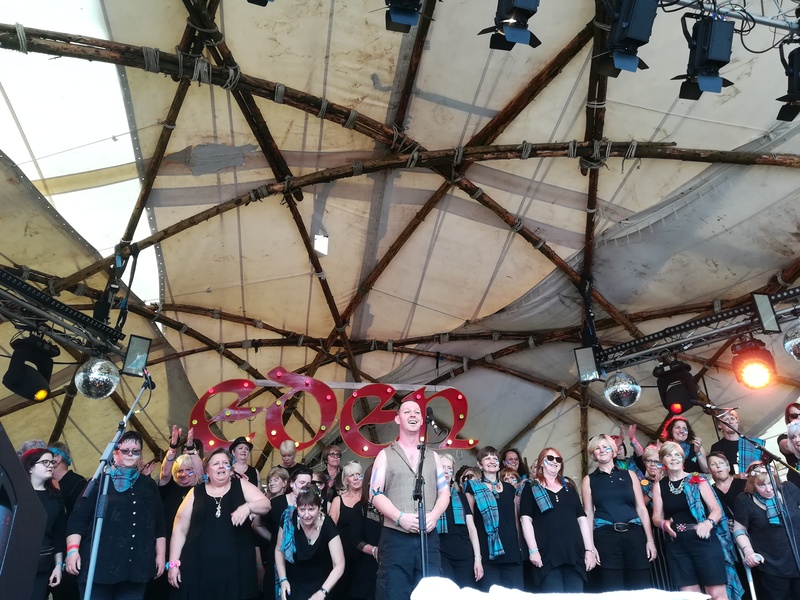 The Sunday Night audience who were now completely bleary eyed and stretched to their emotional limits by the marathon that is Eden were resounding in their affections and appreciation by being led to the finish line by the Leeds based ensemble. Eden has become extraudinary, enticing and epic. In the ten years since it began it has evolved into a wandering wonderland for the wicked and the wise. Its beauty will bulge your eyes, give your ears a continual global musical surprise all of which puts tears in your eyes for the memories and mash with your head with how time flies. The garden of Eden, like a tardis, looks small from the outside, is massive on the inside and while nestled in her belly, will take you out of this world.